The German Lotto is the biggest national game in Germany with drawings that take place every week on Wednesday and Saturday. Millions of people participate in the German Lotto not just because of the super jackpots, but because payouts begin with matching just two numbers and the super ball. This means that there are many winners in each drawing and if the grand prize is not won, the money is rolled over to the next drawing. The largest amount ever won in the German Lotto was €43,382,458 back in 2007 by three people who purchased tickets. Today, ties are broken by chronology which means that the first to purchase has the edge in collecting the winnings. The first recorded lottery of this type in the world occurred in the city of Hamburg in 1614. Today, the German Lotto derives much of its structure from the lotteries of the past and has only changed in terms of how the payouts are implemented. In 1955, the current structure of the German Lotto was implemented which meant that it became a 6/49 lotto system. A super ball was added in May, 2013 which helped to increase the payout. The rules are simple and straightforward. You must purchase the tickets before the deadline of each drawing for them to count. Whether you win or not, you must purchase new tickets for the next drawing. The winning numbers are announced that night and you have a set time to claim your winnings. Simply follow the rules and within a few moments you will have completed the process. Per the German Lotto site, the odds of winning the top prize are considerable, but there have been plenty of winners. The top three winning combinations have the following odds. The odds for winning just 2 main numbers and the super ball are 1 in 76 which means that many people come away as winners when playing the German Lotto. The overall odds when put together are just 1 in 31. 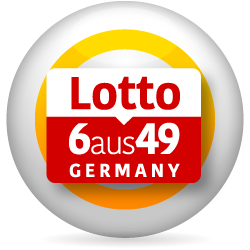 Playing the German Lotto online is much like purchasing tickets at a local participating store. You choose six numbers that range in value from 1 to 49. Once you have selected the six numbers, you then will select the number of the super ball which ranges from 1 to 10. You can choose the numbers yourself or simply go with a random generation which is quicker. Once you have chosen the numbers, you pay for the tickets through your online account using the approved methods of payment as listed on the online lottery website. The tickets you purchase online can be cashed in just like if you had paid for them at a local store. By playing online, you gain considerable convenience since you can purchase the tickets from any location that offers internet service.